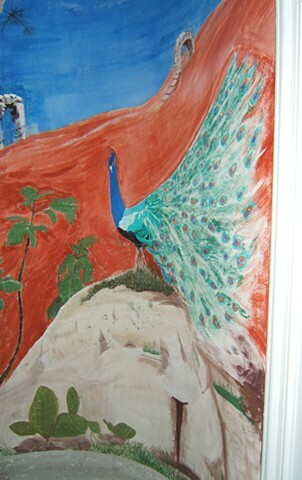 When asked to paint another mural, for a particular client, a peacock kept coming to mind. I looked up its symbolism, and it was apropos. What a challenge in buon fresco - I've never painted so quickly in my life as when I painted the plumage. It was also very windy and my pallette was pulling from my hand. Great practise to refocus on only being one with the painting process. This mural was painted on a exterior wall of a small balcony. I haven't yet captured it in whole because it is on a concave wall. Look forward to a video to truly see its full beauty.